OOC: Hembar's in the basement, waiting for Mars - so she could be waiting a little while. Sorry, Jimmy, I was a bit late for interacting with you before But I'm pretty sure there were some other characters hanging around the office who you can interact with. ooc: I apologise for my awful laziness over these last few weeks. I've just been really unmotivated for this. I guess I was really fired for it when I was writing The Despicable, and now the story's had to be put on hold, my Oddworld-writing-motivationness has sort of died out. I have decided that I am going to drop Grace, because frankly I just can't get him to work. Anyway, he hasn't done anything since W@RF 10 started so I don't think it'll cause any difficulty if I do drop him. I'm gonna drop some of my older characters soon, too, because it's just time for them to move on, and might have another go at introducing some that I might be happier with when the time comes. Anyway, on mit das show. Dionysia was standing in the doorway to the lab, watching the Big Bro (Dbreak) run around the lab sceptically. Since when had any slig on Oddworld ever known anything about how to treat any injury? She snorted when it asked for wood and metal. "What did you do?" She asked, "Beat it a little two badly in a fight and now you're trying to fix it up before anyone notices?" She laughed. "Well... I don't know," Jim replied to Ralph, thinking of Somi and hoping Anni hadn't gone off after the paramite. "Hey, there's the garden she planted outside, to grow spices and stuff for the factory to use in their products. Maybe she went out there." ooc: Yeah, i know kinda convenient that Jim picked the right place out of the air but this is getting rather dull. Feel free to take us outside, Gretin. Last edited by Splat; 03-04-2010 at 06:43 AM..
Flad nodded to KK7's request and picked up a couple of his bags, trying not to carry too much since the added weight might damage his rusty pants. "Alright then, lets go." Flad walked up to the turn in the corridor and looked back waiting for the others. Slen stood stil as Dbreak prodded his arm and Erp entered the Lab. The Big Bro then prodded Slen's left forearm "Argh, that's it" and then Slen realised what the other Mudokon (Dionysia) said. "Heh, no I... Fell down the stairs." Slen said beginning to feel foolish and hoping that the Mudokon doesn't start laughing at him. Appearance: His skin is a little darker then a normal Vykker, and his right eye is black, for he's blind in it. His other eye has a little invention of his, a thermal scanner, like eye-glass, giving him the ability to see things much easier with that eye to make up for only having one. He has a big red "O" on the side of his head, for "Opril". Personality: Down right twisted, he's very hard to read at times as his attitude changes constantly, at times he's kind and helpful.. while other times he's pure evil. Equipment: His Thermal Lens, he wields a small operating saw on one of his hands (Lil' Hacker saw. ), that he switches around to other hands from time to time. And his belt that he keeps his saw in. History: He was the owner of a medical center not far from where new yolk city was. The Medical center (Opril's Cut Hut), got much business.. wandering outlaws would come in to have bullets removed from them and things such as that. One day, while operating on a slog who's jaw had been broken, an outlaw that had been there earlier to have his broken arm repaired, set a fire to the Cut hut. "This'll teach ya' for sowing my arm on backwards, ya idiot!" The outlaw yelled. Opril escaped out the window in the back, making his way off into the deep dark woods. After miles of walking.. feeding off the slog he'd been fixing up before, he reached the feeco depo, hopping onto the train and heading to the popular "Rupturefarms". He realized his business had been ruined.. so he figured he could make a ton of moolah at rupturefarms. Though, he's not sure what he could do at a meat farm. of torture and sorrow here." Opril stated, while walking around aimlessly. wondering if he could hear him yell for help, from where he was at. "Eh, it's worth a try." Opril said, inhaling deeply through his fangs. "ASSISTANCE NEEDED!!!!!!" He yelled at the top of his lungs, hoping the sound vibrations could reach the unknown figure. Ooc: It's Good to be back, kinda. ooc: Ok, first, why are you re-entering the factory? Your character is already in the factory. Second, why did you spam in the profile thread by posting a profile that's already in there? I've deleted your double-post in the profile thread but seriously, why? Ooc: Because i'm restarting from not being here for three months. Roll with it. ooc: So you want us to forget everything you did and try and pretend that it's a new character coming in and not one people already know? No; we're not rewriting the story just for your convenience. Pick up from where you left off (your character can have moved from where he last was, but he's still in the factory) or don't join in. Ooc: i'll just not join in then, kay, kay. IC: Borso nodded. "Okay then, double-time!" He jogs a bit faster, trying to carry some of the bags without dropping them. Borso caught up to Flad and gave him a cheeky smile before overtaking him and moving forward. OOC: Okay KK7, your turn! I am surprised to see Opril back, I thought that character was gone for good. Oh well, should be interesting at least. Taking up everything he could, even with the few tentacles he had, KK7 muffled something between the lines of a "Thank you" and something understandable thanks to his babbling. He simply got the things and huffed forward to fallow the others as fast as he could with the damn ton of things the two of them had packed. Sighing, Dbreak touched again the arm of Slen with a grunt escaping his mouth. "I thought this management was a bit different than most places?" He asked out loud while letting Slen's arm quietly over the table "Don’t move that... Why should I beat someone down then?" He looked at whoever had spoken, half hoping for a Vykker, but seeing a Mudokon with strange coloration, and stranger, a female. He was not used to them since they hardly were seen, they were up for more delicate work since they weren’t as strong as males, as well as for the reason they broke easily... Dbreak didn’t like the last reason but the Glukkons were that friendly. Dbreak grunted, thinking that he should finish and return with his friend soon or he would, sooner or later, blow something up if he felt under pressure. Finally he took up Slen's arm again and spoke without looking at anyone in particular "Now, if someone is kind enough to give me what I asked? The bone, I think is broken, needs at least a mending so it doesn’t get any worse"
ooc: Well, I'm waiting for Gretin so I can move Jim, but I've been waiting a long time so I'll get on with Dionysia! Dionysia was slightly annoyed that the big bro had been able to answer her reasonably, so she retorted irritably, "Oh yeah? Every other big bro I've met has been the same; the drugs they use to pump them up like a balloon turns their brains to mush." She let that insult hang for a moment before adding, "Anyway, who taught you medicine?" OOC: I'm waiting on Gretin too. Damn that guy, he always takes AGES to post! I could have, but I didn't think it was terribly realistic for Jim and Ralph to have followed and conveniently not been seen by the vykker who came and modified SU-01, and surely they wouldn't have taken THAT long to follow him that the vykker had already left. But nevermind, what's done is dumb. I mean, done. "Alright," Ralph replied to Jim, "let's go then." They went out the exit of the building rather uneventfully, then in the distance Ralph could see, sure enough, the pink mudokon (Anni) tending to some garden. "Looks like you were right," he said to Jim, then fell silent - he barely knew the girl so he'd let Jim do the talking. ooc: Mars and Hembar are the only two left in the basement. Hembar has been standing around waiting for your narcoleptic mudokon to do something. Would it be okay to have a female slig? Tt be a sub-specie of slig. Last edited by Crescent; 03-17-2010 at 02:14 PM..
ooc: There have been female sligs in the past, though they've been a lot less common than female mudokons. So yeah, you can be one, but as a general rule W@RF has been pretty against 'original species', so I suggest you make her a part of the normal slig race who's female because of a genetic mutation or vykkers' experiment or something, and refine her backstory a bit. Also, if you haven't RPGed before, you should read the 'Information and Advice for RPG Newbies' thread first. "Lonely...I'm so lonely...I have nobody...to RP wiiiiith"
"Well, seems like I won't be able to accomplish my objective anytime soon. Better use my "unemployed time" wisely. I'll go check some security systems around the facility. I hope this will help sorting that terrorist threat issue." And so he took some random corridors, checking his plans of the factory, fixing broken security stuff here and there. He finally decided to go outside of the building for what he thought would be the first time since his arrival. He headed to the Fee-Co station and hovered under the tracks to finally reach the ground. He went around the stockyards, trying to fix the fences the best he could, but he soon gave up, after seeing the miles of damaged fences around him. "Let's find another way to keep those Mudokons away" he thought. " The outside watchtowers don't look too damaged, and according to my plan, they are powered by a generator nearby." He looked up at the grayish sky around the factory. These clouds were creating a permanent twilight, be it the morning or the middle of the day. "Lighting up the surroundings would be a good start." He headed to the generator bay, next to the stockyards. He finally arrived in front of the room he was looking for. According to its plans, the generator was more like a switch, as it was already powered by the main generator that kept the meat processing machinery running. He pulled down a couple of levers and the generator finally started. He went outside. The watch towers were slowly lighting up, spreading a yet dim but soon to be powerful light around them. "Try to sneak past this now. You will be as stealthy as a Sligmas tree. And the last thing you'll see will be a half-hundred red dots on your chest. At least you'll die being useful...Free Mudokon Pops meat, native flavored" SU said in a cold voice. Last edited by Jimmy-le-sniper; 03-18-2010 at 01:49 AM..
Sweet ^w^ okay I'll see what I can do be back on Thursday or Firday. been up all night studying so needs rest now. I had another slig that was male called Mace and he was a grey colour due to wandering into a temple and gets granted parmite tatto. 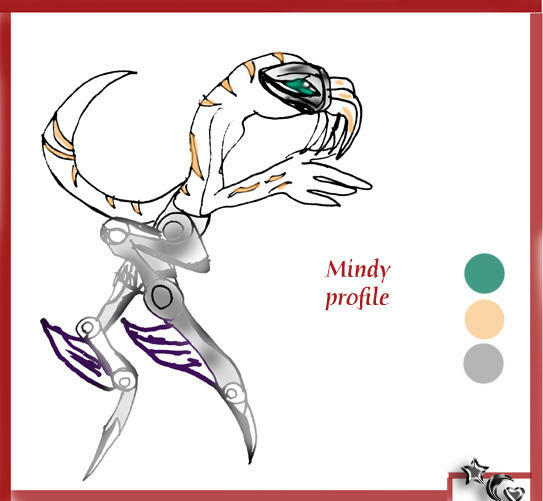 For Mindy's case I guess for her she could be a female mutant much like the albino slig? Perhaps she was just born infertile. Don't forget to post a profile. Flad laughed as Borso went on ahead after giving him a cheeky smile. "R+R is just up ahead" Flad said to KK7 and led through the door after they finally reached it. Once entering the room and placing KK7's bags next to a nearby bed Flad looked out a window to see the lights gradually lighting up brighter and brighter. The view started to make Flad relax and for the first time he realised that the travelling to Rupture Farms and the chasing of the native Mud had tired him out. "Hey Borso, is that Nap still available?" Flad asked, walked over to a bed and collapsed onto it "I think I'll join you"
Hellos popping on to drop off Mindy's pofile. of her head, trails down her back and has a few stripes on her tentacle mouth. button on the belt line. repairing things makes a great self defence weapon. Carried off unconscious by a big bro slig who had taken Mindy to an underground Vykker's lab. tracking bangle that she can't get off. OOC: Firstly, welcome Cresent. Mindy sounds like an interesting character. I like the drawing of her. Sounds like Borso found some company! (wolf whistles!) Just kidding! IC: Borso walked through the door and sneezed, the dust on the wall was pretty pungent and made him want to open a window. He decided to just brush the dust away instead. Borso was surprised for a moment. "Oh um, yeah", Borso moved nervously to his bunk and was glad that Sligs enjoyed to sleep in seperate beds. Borso sighed, "I feel so alone sometimes" Borso shivers to himself, putting a blanket overhimself and falling to a sleep. He dreams about a female Slig called Prudence. The Slig is flying in the sky with wings. The Slig appears to be carrying a large stash of diamonds. When Borso awakes, he does not remember the dream at all. Subtlely write your character out of the story somehow. For the love of God, don't start spamming again. what does he look like is he the same as the red slig in your avitar? Right I will make a start finally. Sodium-vapor lamp from outsight harshly loomed and settled upon a hammock made from pacthes of padded wall mat and scrubs where a sleeping slig was snug as a bug in the blanket. This slig was rare upon its kind for one it was female, creamish-ivory skin with light orange tiger like markings dotted round her body. she would offten plot how to escape but ended up failing. The only way out now it seemed was to get out this hell hole was to some how get a promotion discretely but how? Last edited by Crescent; 03-20-2010 at 12:38 PM..
Also, remember to keep track of the timeline of the story as it goes on. So not a lot of time is passing in the RPG at the moment so if your character had to think of a plan and pull it off and all before coming, it would be a long time before she got here! You want to try and move at the same pace as everybody else. Appearance: Big scar in head otherwise looks like normal Slig.